Author Marc Brackett talked with a friend who had undergone divorce and found that (as he writes in the preface to this delightful self-help book) "It (divorce) has worn him (the friend) out mentally, physically, and spiritually. There are things in life that cannot be undone or forgotten and just have to be lived with." The author has studied marriages and divorce at length and has devised this easy to read e-book that creates a mathematical point system, one for men and another for women, with four components so that the reader can evaluate and understand where his/her marriage or proposed marriage stands. But author Brackett wisely admonishes the reader on page 58 that "This book is not about creating a checklist you could use to humiliate your partner. This book was intended to help you become more of the person your partner needs in their life." "Keeping Score" is a wonderful addition to the many books out there on marriage counselling. It is short, easy to read and use in everyday life, and to the point. The formatting is excellent and the graphs help illustrate the points the author is making. The author's intent, as he writes on page 60, is to "focus on modifying your own behavior". His statements are simple but highly useful and profound in their own way. He writes, on page 54: "The little things are the foundation of everything" referring to small tasks such as folding socks or taking out the garbage. 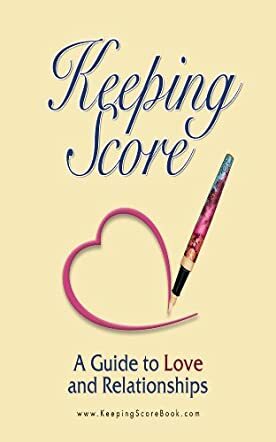 "Keeping Score" should be on readers' lists everywhere and should be a standard stock on marriage counsellors' lists of must reads. "Keeping Score" by Marc Brackett describes itself as “a common sense approach to relationship evaluation” with a bit of math thrown in. The author makes the valid point that a relationship is like a garden - things are going to grow and change in it. Some elements may bloom and bear fruit while others might wither. There is a constant need to reevaluate any relationship, before those damaging ruts get slipped into. This is an interesting and helpful book whether you are married, in a steady relationship or single and dating. It really is for any adult and ties in with a website with free evaluation forms that you fill in and then you use the score key at the end of the book to see how you shape up relationship-wise. Honest evaluations are essential to get the best out of this well-thought-out little book. The book is divided into sections for Adam and Eve, i.e., men and women. There are slightly different sets of questions aimed at each gender. Brackett uses euphemistic headings for the subsections of the book - ‘castle versus cave’ when looking at financial matters within the relationship, and ‘handle with care’ when dealing with intimacy, for example. This lends a light touch that keeps the tone from getting too serious. Women assess their partners on financial matters, feeling loved, and common interests while the men assess the women on appearance, attitudes to finance, nurture and loyalty, and then again on common interests. At the end the author evaluates the various factors and rates them as granite, steel, plastic and tin foil, according to how much they can be bent or altered. The book is a mine of practical advice and achievable aims. "Keeping Score" is a great way to assess your relationship. I highly recommend reading this book and taking the quiz before marriage. It is an excellent tool for evaluating the true basis of a relationship. When we are first involved in relationships usually we respond with our emotions. This book/quiz is based on common sense rather than emotion. Brackett says the quiz utilizes a math format. It is obvious the author spent much time researching the topic and drew from his own personal experiences and the experiences of acquaintances in creating this book. The author also refers the reader to his website for more information. This book would actually work well for other forms of adult relationships as well. After all, relationships are needed and yet are extremely intricate and challenging to maintain. Marc Brackett was inspired to write this book after talking with a friend who had recently attended the wedding of his ex-wife. The friend shared the emotional, physical and spiritual burden the divorce had caused him. "Keeping Score" is a unique relationship book. The basis of this book is two relationship quizzes, one for males and the other for females. The questions are divided into several categories. Each category deals with a different aspect of a relationship. The categories run the gambit from finance, trust, affection and career goals. The questions for the males are not the same as for the females, which makes sense when you consider the different needs of men and women. The purpose of this book is to assist the reader to become aware of their partner’s needs. This unique relationship book will make a great addition to a public library, church library, relationship counselor’s library or for the individual. Relationships are very complex, no doubt about it. Sometimes people need something to help them analyze where they are and use that information to redirect. Using the book and the online question and answer worksheet, the reader answers questions to come up with a total score. Using this score, they are able to see where they are in the scheme of things. The book is easy to read as is the worksheet. This combination is good for everyone, regardless of their relationship status. There are many good points made throughout about a plethora of subjects. Life is difficult, to say the least. This book helps us take the stress off of some of the choices we have to make. The author is very knowledgeable on the subject matter. While I felt that some of it was subjective, I chose to realize that we all cannot agree on everything and filtered through the things that were relevant to me. The checklist is an interesting, informative tool that might be an eye opener when you get to the end to find your score. This book and its related worksheet would be an ideal addition in any library (although you would need the printed version of the worksheet of course), counseling center and/or personal library collection. It would be interesting to go back through it after a period of time and see if the answers are different. Change is a good thing and those who help us see the changes we need are really providing a great service to us. "Keeping Score" assists readers in examining their relationships. The book is divided into a section for males and one for females. The questions in each section are “unique for that gender.” There is also a section that is “identical for both partners.” The questions are simple and easy to understand. I am sure the reader should be able to answer the questions. There is also a section that will assist the reader in interpreting their score. The questions are related to various topics such as financial issues, in laws, children, beliefs, education, affection, trust, and sense of humor. Marc Brackett combines humor with common sense in "Keeping Score". This is not your run of the mill, same old approach to relationships. I enjoyed the quotes strewn throughout the book as they add wisdom and humor to the text. Brackett’s approach to relationships is unique. I highly recommend this book.